Contact us for more information on any of our products and services. Roederer Transfer & Storage a Mayflower Agent, has been providing moving and storage services since 1927. Whether it's a local or long distance move, no move is to large or to small for them. Their locations include Davenport, IA (Quad Cities) and Cedar Rapids, IA. 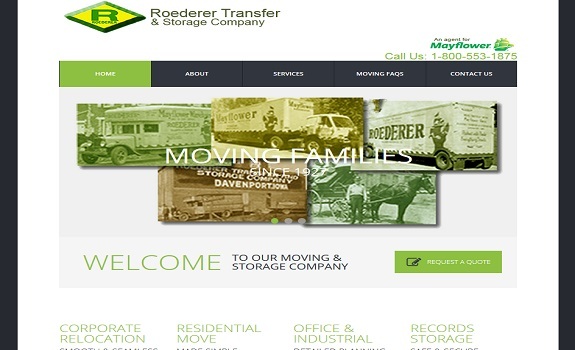 MoPoe & Associates teamed up with Roederer Transfer & Storage Company to strategically re-design a new website. We created a modern website design that looks good on all mobile devices, is search engine optimized and showcases all of their moving and storage services. We also provided an area for their most frequently asked questions regarding their moving services and provided moving and storage tips to ease their clients' transition. To learn more about Roederer Transfer & Storage (Mayflower Agent), please visit their website at www.roederertransfer.com. MoPoe & Associates is a Growth Strategies, Training, and Business Support Company located in Rock Island, Illinois, which is across the river from Davenport, Iowa (Quad Cities Illinois/Iowa area). We specialize in Technology & Marketing Solutions for businesses looking to regain time, stay connected to their clients, and ultimately attract new ones. For more information on our web design and internet marketing services, please explore our website.